Eukaryotic gene expression is more complex than prokaryotic gene expression because the processes of transcription and translation are physically separated. Unlike prokaryotic cells, eukaryotic cells can regulate gene expression at many different levels. Eukaryotic gene expression begins with control of access to the DNA. This form of regulation, called epigenetic regulation, occurs even before transcription is initiated. The human genome encodes over 20,000 genes; each of the 23 pairs of human chromosomes encodes thousands of genes. The DNA in the nucleus is precisely wound, folded, and compacted into chromosomes so that it will fit into the nucleus. It is also organized so that specific segments can be accessed as needed by a specific cell type. The first level of organization, or packing, is the winding of DNA strands around histone proteins. Histones package and order DNA into structural units called nucleosome complexes, which can control the access of proteins to the DNA regions ([link]a). Under the electron microscope, this winding of DNA around histone proteins to form nucleosomes looks like small beads on a string ([link]b). These beads (histone proteins) can move along the string (DNA) and change the structure of the molecule. If DNA encoding a specific gene is to be transcribed into RNA, the nucleosomes surrounding that region of DNA can slide down the DNA to open that specific chromosomal region and allow for the transcriptional machinery (RNA polymerase) to initiate transcription ([link]). Nucleosomes can move to open the chromosome structure to expose a segment of DNA, but do so in a very controlled manner. In females, one of the two X chromosomes is inactivated during embryonic development because of epigenetic changes to the chromatin. What impact do you think these changes would have on nucleosome packing? How the histone proteins move is dependent on signals found on both the histone proteins and on the DNA. These signals are tags added to histone proteins and DNA that tell the histones if a chromosomal region should be open or closed ([link] depicts modifications to histone proteins and DNA). These tags are not permanent, but may be added or removed as needed. They are chemical modifications (phosphate, methyl, or acetyl groups) that are attached to specific amino acids in the protein or to the nucleotides of the DNA. The tags do not alter the DNA base sequence, but they do alter how tightly wound the DNA is around the histone proteins. DNA is a negatively charged molecule; therefore, changes in the charge of the histone will change how tightly wound the DNA molecule will be. When unmodified, the histone proteins have a large positive charge; by adding chemical modifications like acetyl groups, the charge becomes less positive. The DNA molecule itself can also be modified. This occurs within very specific regions called CpG islands. These are stretches with a high frequency of cytosine and guanine dinucleotide DNA pairs (CG) found in the promoter regions of genes. When this configuration exists, the cytosine member of the pair can be methylated (a methyl group is added). This modification changes how the DNA interacts with proteins, including the histone proteins that control access to the region. 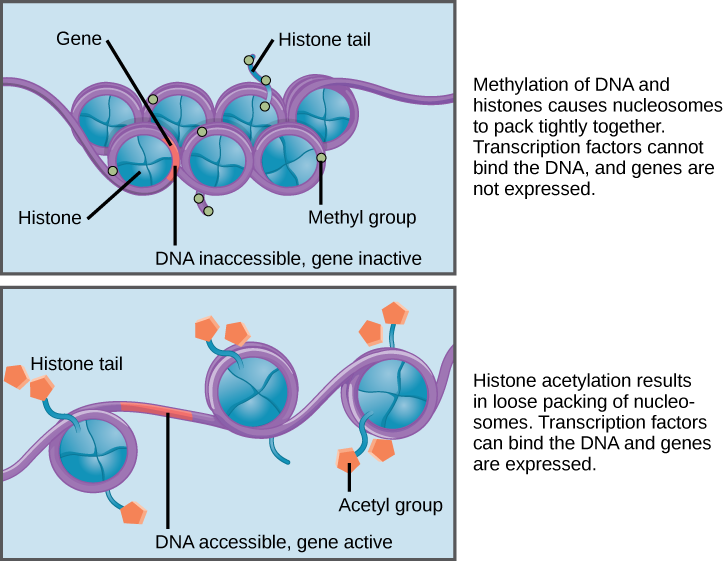 Highly methylated (hypermethylated) DNA regions with deacetylated histones are tightly coiled and transcriptionally inactive. This type of gene regulation is called epigenetic regulation. Epigenetic means “around genetics.” The changes that occur to the histone proteins and DNA do not alter the nucleotide sequence and are not permanent. Instead, these changes are temporary (although they often persist through multiple rounds of cell division) and alter the chromosomal structure (open or closed) as needed. A gene can be turned on or off depending upon the location and modifications to the histone proteins and DNA. If a gene is to be transcribed, the histone proteins and DNA are modified surrounding the chromosomal region encoding that gene. This opens the chromosomal region to allow access for RNA polymerase and other proteins, called transcription factors, to bind to the promoter region, located just upstream of the gene, and initiate transcription. If a gene is to remain turned off, or silenced, the histone proteins and DNA have different modifications that signal a closed chromosomal configuration. In this closed configuration, the RNA polymerase and transcription factors do not have access to the DNA and transcription cannot occur ([link]). In eukaryotic cells, the first stage of gene expression control occurs at the epigenetic level. Epigenetic mechanisms control access to the chromosomal region to allow genes to be turned on or off. These mechanisms control how DNA is packed into the nucleus by regulating how tightly the DNA is wound around histone proteins. The addition or removal of chemical modifications (or flags) to histone proteins or DNA signals to the cell to open or close a chromosomal region. Therefore, eukaryotic cells can control whether a gene is expressed by controlling accessibility to transcription factors and the binding of RNA polymerase to initiate transcription. [link] In females, one of the two X chromosomes is inactivated during embryonic development because of epigenetic changes to the chromatin. What impact do you think these changes would have on nucleosome packing? [link] The nucleosomes would pack more tightly together. 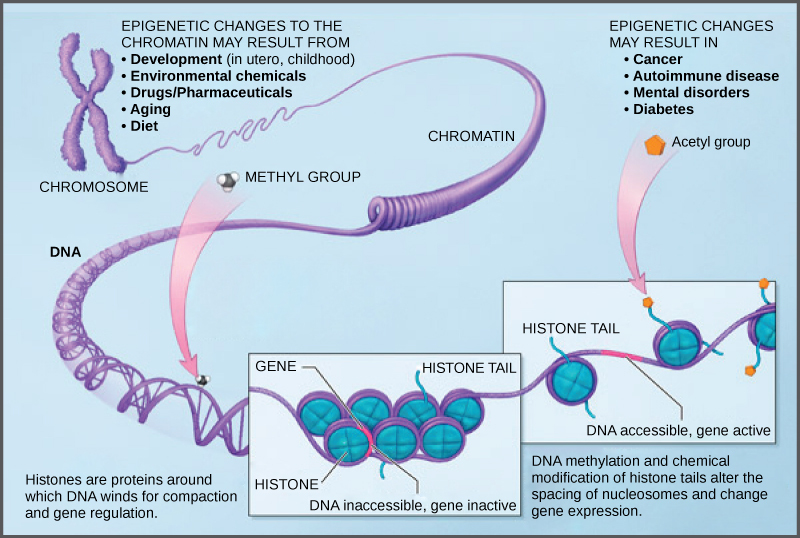 Which of the following are true of epigenetic changes? In cancer cells, alteration to epigenetic modifications turns off genes that are normally expressed. Hypothetically, how could you reverse this process to turn these genes back on? You can create medications that reverse the epigenetic processes (to add histone acetylation marks or to remove DNA methylation) and create an open chromosomal configuration. 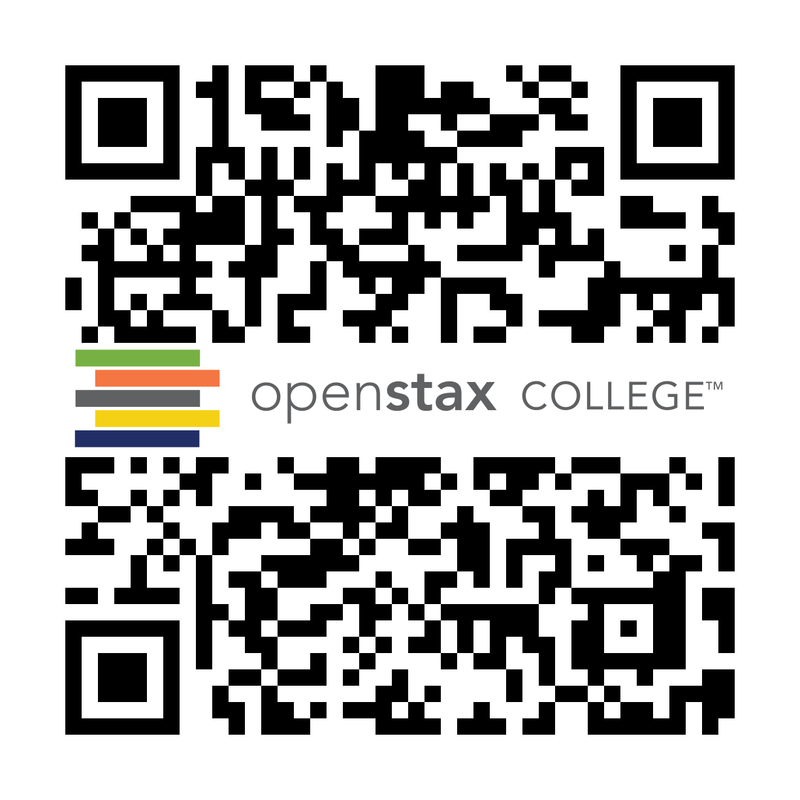 Eukaryotic Epigenetic Gene Regulation by OpenStaxCollege is licensed under a Creative Commons Attribution 4.0 International License, except where otherwise noted.